The rumors of a Robotech live action movie have been circulating for almost a decade with names like Tobey Maguire, Lawrence Kasdan and even Leonardo Di Caprio attached. But now that the rights have gone from Warner Bros to Sony Pictures, events behind the scenes have started to pick up the pace (finally). As reported on DenofGeek.com, Harmony Gold’s president of animation Tommy Yune does point out that Sony did not pick up any of Warner Bros previous work on the Robotech project. This means none of the previously plots or script ideas come into play and Sony is talking a page one rewrite. Macross was the most popular of the series with characters like Rick Hunter, Roy Fokker and Max Sterling, the large transforming fighter jets and massive SDF-1 Battleship (think S.H.I.E.L.D. Helicarrier in space) that people think of when they think Robotech. Robotech was actually comprised of three completely separate anime series (1982’s Super Dimension Fortress Macross, 1984’s Super Dimension Calvary Southern Cross and 1983’s Genesis Climber Mospeada) that Harmony Gold USA picked up the North American distribution rights to. They then wrote alternate storylines connecting the three series and dubbed them in English with a whole new soundtrack. Unlike most cartoons at it’s time, Robotech dealt with many adult core values including love, war, insecurities, death and interracial relationships. The end result was the Robotech series which was one of the pioneers credited with kicking off North America’s still growing interest in anime. With the special effects available today and a strong character driven storyline, a Robotech live action movie could be incredible! 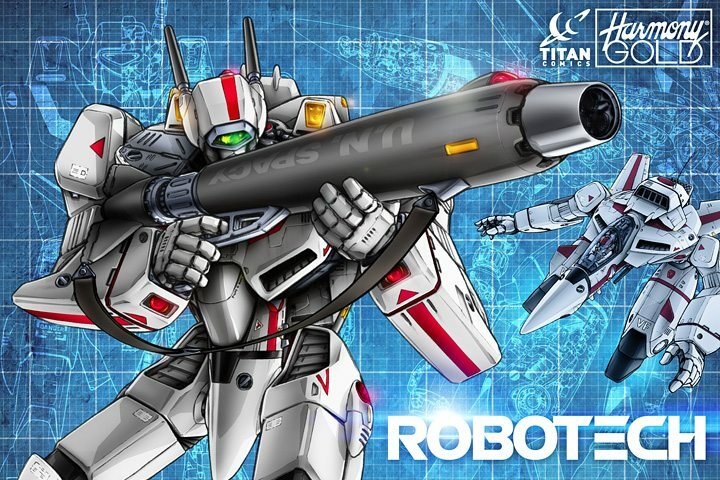 Also in recent Robotech news, Titan Comics announced that they have picked up the rights to begin publishing all new Robotech comics sometime this year. I will keep you posted more movie news is released. Show your support for the Skull Squadron! Previous Will Consumers Want YouTube TV’s Slimmer Offerings?